The government in Israel presents us with more proof, every day, that it represents and adopts an aggressive approach that is not interested in peace, or even willing to respect international laws and conventions. It also gives us evidence that it wages wars for the sake of it and in order to satisfy its rampant desire for aggression and expansion, serving its criminal objectives against the Arabs in general, and the Palestinian people in particular. Although Israel’s leaders have typically hidden the objectives of their violent wars under various pretexts, such as preventative or pre-emptive action and other justifications that they try to promote to the world, it is noteworthy that, despite their various operational names, these wars are not all that Israel is doing or thinking about. There are wars for other reasons that demonstrate the moral decline of Israel’s ruling establishment and the level of criminality and brutality it has reached. In a report by Israeli writer Rogel Alpher, in Haaretz, he explains why Israel might launch another war against the people of Gaza. While the occupying state always tries to justify its aggression as “self-defence”, Alpher reveals that a new war is needed so that the Israeli arms industry and Defence Forces can field test new weapons and ammunition against live targets. This is sickening. Although he also mentioned that, among the reasons which may lead Israel to war are internal disputes and the upcoming elections, the fact that it can even be talked about testing new weaponry, in this way, is itself criminal and potentially a flagrant violation of all morality and international laws and conventions. It also reaffirms what was revealed by Israeli film-maker Yotam Feldman in his 2013 film, The Lab. So, this is nothing really new. 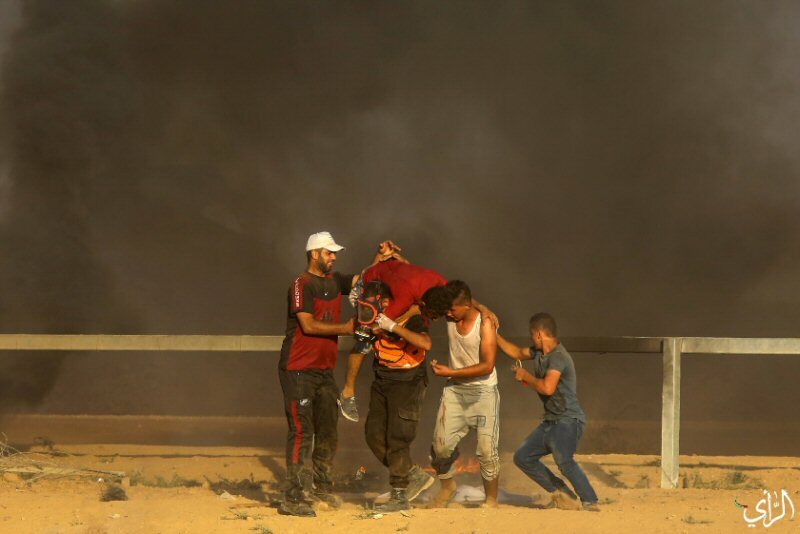 If we take into account the unjust siege imposed by the Israeli occupation on more than two million Palestinians in the Gaza Strip, turning the enclave into the largest prison in the world, the testing of Israeli weapons in the territory adds a new and shameful dimension to the ongoing Israeli crimes against the Palestinian people. We can also throw in Israel’s use of internationally banned weapons over a number of years. We would need a lot of time and effort to record all Israeli crimes committed against the Palestinians, from pre-1948 to today. The state of Israel itself was founded on massacres of Palestinian civilians by Zionist terrorist gangs. Since then, there have been countless crimes committed, including unlawful killings, forced displacement, arbitrary detention, the siege and other unjustifiable restrictions on movement, illegal settlements and discriminatory policies and practices, including openly racist laws. It goes without saying that Israel would not have been able to commit all of these crimes without the unlimited and unquestioned support of many colonial powers, particularly the US, and the willful disdain for international public opinion and international law. Unfortunately, it seems that such legal restraints are only to be used when it suits the victors of World War Two and the other nuclear powers. They do not intend to restore the rights of oppressed peoples, but to justify persecution or injustice under false slogans and pretexts. As such, it is logical to say that Israel will not stop committing its crimes, but will intensify them, as long as there is no Arab power ready to stop it or a serious will to contain and limit its criminal role in our region. The colonial state not only threatens peace and security in the Middle East, but also around the whole world. Its weapons testing, on live targets in the besieged Gaza Strip, is a clear demonstration of the fact that Israel will stop at nothing to achieve its aims and objectives. The Secretary-General of the Palestine Liberation Organization, Saeb Erekat, stated Thursday that the speech by Israeli Prime Minister Benjamin Netanyahu at the United Nations General Assembly on Thursday victimizes the criminal and blames the victim. This follows a statement the previous day by Erekat, in response to Trump’s UN speech, that Trump, through his speech, has shown that the U.S. has closed the door to peace. In Erekat’s statement, he said, “Netanyahu’s speech is a combination of old and well-known talking points that conclude on victimizing the criminal and blaming the victim. His speech further exposes Israel’s systematic denial of our right to exist, to live in freedom and to celebrate our national identity. 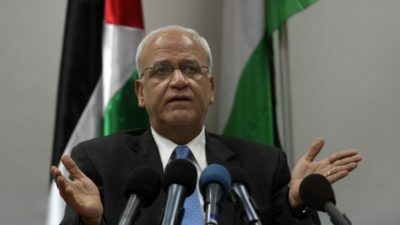 In his statement about Trump’s speech the previous day, Erekat stated, “President Trump has confirmed that his administration has closed the doors to peace and cannot play a role in peacemaking by stating that his decision to move his embassy to Israel to Jerusalem, in violation of Security Council resolution 478, was a ‘recognition of reality’. Rather, what his administration did, and continues to do, is to reward and incentivize violations of international law, colonization, war crimes, and apartheid. “His rejection of the International Criminal Court is a rejection of international law. It should be noted that Israel, the occupying power, did not implement any of the UN Security Council and General Assembly resolutions. The reality today is that due to the one-sided pro-Israel decisions of the US administration, peace between Palestinians and Israelis have been derailed. Erekat served as the chief negotiator for the Palestinian-Israeli peace talks over several decades. Published By the Palestinian News & Info Agency (WAFA): President Abbas at UN calls on US to rescind decisions on Jerusalem, refugees.NEW YORK, September 27, 2018 (WAFA) – President Mahmoud Abbas called on the United States administration to rescind its decision on Jerusalem and refugees in order to salvage the prospects for peace. Addressing the 73rd session of the United Nations General Assembly, President Abbas also called on Israel to honor and abide by the agreements it had signed with the Palestinians over the years otherwise the Palestinians will not abide by them anymore. resolutions, as well as the understandings among us, in order to salvage the prospects for peace and to achieve stability and security for the future generations in our region,” said Abbas. “We have concluded agreements with Israel and they have abrogated all of them. Either Israel abides by these agreements, or else we will renege on them. Israel will bear the responsibility and consequences of this,” he said. The President strongly criticized Israel’s Nation-State Law, which he described as racist. “This law denies the connection of the Palestinian people to their historic homeland and dismisses their right to self-determination and their history and heritage, as well as the United Nations resolutions relevant to the Palestine question and the agreements concluded with Israel. This law will inevitably lead to the creation of one racist State, an apartheid state, and nullifies the two-State solution,” he said. He also said that he extends his hands for peace, stressing that he wants a Palestinian states established by peaceful means. “Here, I must reiterate that we are not against negotiations and have never rejected negotiations, and that we continue to extend our hands for peace,” he said. In these days last year, I came before you appealing for freedom, independence and justice for my oppressed people, who are suffering under Israeli occupation for more than fifty-one years. I return to you today as this colonial occupation continues to suffocate us and to undermine our serious efforts to build the institutions of our cherished State, which this august General Assembly recognized in the year 2012. This year the Palestinian National Council, the parliament of the State of Palestine, convened and renewed the legitimacy of our national institutions through the election of a new leadership for the Palestine Liberation Organization (PLO), the sole legitimate representative of the Palestinian people. This Parliament undertook important decisions, which oblige me to review the agreements, political, economic and security alike, that have been reached with the Israeli Government, and to also review the future of the Palestinian National Authority, which has been rendered without authority. The Parliament also instructed me to suspend the Palestinian recognition of Israel until Israel recognizes the State of Palestine on the 4 June 1967 borders, and also instructed me to approach the international courts, including the International Criminal Court (ICC), to investigate Israel’s breaches of treaties and the Israeli occupying forces’ aggressions and settler terror against our people, our land and our holy sites. Last July, Israel adopted a racist law that crossed all the red lines and called it the “Nation-State Law of the Jewish People”. This law denies the connection of the Palestinian people to their historic homeland and dismisses their right to self-determination and their history and heritage, as well as the United Nations resolutions relevant to the Palestine question and the agreements concluded with Israel. This law will inevitably lead to the creation of one racist State, an apartheid state, and nullifies the two-State solution. This law discriminates against the Palestinian-Arab citizens in Israel, granting the right to self determination exclusively to Jews in Israel and legislating discrimination against those Arab citizens, who constitute 20% of the population of Israel, in addition to other non-Jews who have immigrated to Israel. This law strips them of their rights as citizens. This law constitutes a gross breach and real danger, both politically and legally, and reminds us of the apartheid state that existed in South Africa. We therefore reject and condemn it in the strongest terms. We further call on the international community and this august Assembly to act to reject it and condemn it as a racist, illegal law and deem it null and void, just as the United Nations condemned apartheid South Africa in several resolutions in the past, bearing in mind also that thousands of Jews and Israeli citizens have rejected and protested this law and 56 Knesset Members out of 120 voted against it. This racist law talks about what is called the “land of Israel”. Can you ask the Israeli government what exactly constitutes the “land of Israel”, what the “borders” of the State of Israel are? I challenge anyone to tell us what they are. This racist law constitutes another stigma on Israel and anyone who consents to it. This law is just like other Israeli laws that legislated the theft and confiscation of the land, properties and funds of the Palestinian people. We have always fully and positively engaged with the various initiatives of the international community that have aimed at achieving a peaceful solution between us and the Israelis, including the Arab Peace Initiative, which was recognized by the Security Council in its resolution 1515 (2003). We continued on this path with the administration of President Trump from the start of his tenure, with the same positive engagement, and I have met with him numerous times. We awaited his peace initiative with utmost patience, but were shocked by decisions and actions he undertook that completely contradict the role and commitment of the United States towards the peace process. In November 2017, his administration issued a decision to close the PLO office in Washington, DC. He then announced his recognition of Jerusalem as the capital of Israel and transferred his country’s embassy from Tel Aviv to Jerusalem, and boasts that he has removed the issues of Jerusalem, refugees, settlements and security off the negotiation table. All such decisions threaten the Palestinian national cause and constitute an assault on international law and relevant United Nations resolutions. The US administration went even further in its assault by cutting assistance to the Palestinian National Authority, UNRWA and Palestinian hospitals in Occupied East Jerusalem. With all of these decisions, this administration has reneged on all previous US commitments, and has undermined the two-State solution, and has revealed its false claims of concern about the humanitarian conditions of the Palestinian people. It is ironic that the American administration still talks about what they call the “deal of the century”. But what is left for this administration to give to the Palestinian people? Humanitarian solutions? And, the US Congress continues to insist on considering the Palestine Liberation Organization – which is recognized as the sole, legitimate representative of the Palestinian people by the overwhelming majority of countries of the world, including Israel – as a terrorist organization, at a time when the State of Palestine cooperates with the majority of countries of the world, including the United States, to combat terrorism. For years, we have affirmed our readiness to the US administration to establish a Palestinian-American committee to examine the political and legal status of the PLO as a means of proving to them that the PLO is committed to achieving peace and combating terrorism, as well as to also demonstrate that Congress’ legislation regarding the PLO is arbitrary, unlawful and unjustified and deliberately ignores the official agreement with the US Government to combat terrorism, an agreement we have also concluded with 83 other countries. Despite all of this, and from this august platform, I renew my call to President Trump to rescind his decisions and decrees regarding Jerusalem, refugees and settlements, which contravene international law and UN resolutions, as well as the understandings among us, in order to salvage the prospects for peace and to achieve stability and security for the future generations in our region. Consistent with our commitment to peace and the two-state solution and the path of negotiations to achieve them, a path we have never refused, and with a view to rescuing the peace process, I came before the Security Council on the 20th of February this year and presented an initiative calling for the convening of an international peace conference based on the relevant UN resolutions and the internationally endorsed terms of reference and parameters. Such a conference should involve broad international participation that includes regional and international stakeholders, led by the Permanent Members of the Security Council and the Quartet. We shall circulate this initiative in its entirety to you and hope you will support it. Here, I must reiterate that we are not against negotiations and have never rejected negotiations, and that we continue to extend our hands for peace. Peace in our region cannot be realized without an independent Palestinian State, with East Jerusalem as its capital, and not some place in East Jerusalem as its capital, and with all of its holy sites. There is no peace otherwise. There is no peace with a state of temporary borders. There is no peace with an alleged state in Gaza. The path to peace is enshrined in your resolutions, including resolution 67/19 of 29 November 2012, which was adopted by an overwhelming majority and refers to the State of Palestine on the basis of the 1967 borders. I thus call upon all the countries of the world that have not yet recognized the State of Palestine to accelerate this long-overdue recognition. I can no longer see a convincing reason for the continued delay of recognition of the State of Palestine by some countries. In this context, I wish to draw your attention to the fact that, in 2019, the State of Palestine will chair the Group of 77, which represents 134 States, and I urge you to support the request to enhance the State of Palestine’s status during its tenure and to allow it to exercise its full responsibilities on behalf of this Group. In this regard, I wish to convey our appreciation and gratitude to Colombia for its recent recognition of the State of Palestine, becoming the 139th State to recognize our State, and likewise to Paraguay, which had previously recognized the State of Palestine and decided to return its embassy from Jerusalem to Tel Aviv, and I urge Guatemala to do the same. Here, I must once again call upon the British Government – which bears a historical, political, legal and moral responsibility with regard to the suffering and displacement of the Palestinian people as a consequence of the Balfour Declaration of 1917 – to rectify this historic mistake by recognizing the State of Palestine and compensating the Palestinian people for their pain and suffering. I also call upon the United States of America, which strongly supported the Balfour Declaration and cooperated with Great Britain to implement it, to do the same. I must remind you once again that Israel, the occupying Power, has not implemented any single resolution of the hundreds of resolutions adopted by the Security Council, most recent of which was resolution 2334 (2016), and by the General Assembly regarding the question of Palestine. Is it acceptable that Israel remains without accountability or consequence? Is it acceptable that Israel remains a state above the law? Why does the Security Council not uphold its duties to compel Israel to abide by international law and to bring an end to its occupation of the State of Palestine? Madame President, Distinguished Representatives gathered here in this General Assembly. We resist this colonial, settler Israeli occupation through the legitimate means created by this international organization. Foremost among these is peaceful, popular resistance as we witness today in the Great March of Return in Gaza. We also see it in other areas of our occupied territory, such as in Khan al-Ahmar, which the Israeli Government has decided to forcibly uproot and displace its Palestinian inhabitants, who have lived there for more than 50 years, in order to illegally impose settlement activities in that area and to sever the contiguity of the Palestinian State. Our Palestinian people and the territory of the State of Palestine are in more urgent need of international protection than at any time before. Here, allow me to express our deep appreciation and respect to the States that supported the resolution on protection for the Palestinian civilian population, which was adopted on 13 June 2018, and to urge you to find the mechanisms necessary to provide protection as soon as possible. We also express our thanks to the Secretary-General for his report in this regard. While we welcome all the economic and humanitarian support to our people in the West Bank and the Gaza Strip through the legitimate Palestinian institutions, we refuse that this support be considered a substitute to a political solution that would bring an end to the Israeli occupation and achieve the independence of the State of Palestine on the ground. This support also cannot be considered an alternative to lifting the Israeli blockade and ending the division between Gaza and the West Bank, and we will firmly stand against any attempts, under any pretext, to separate our beloved Gaza from our State. We continue to exert genuine, serious efforts to end the division and to achieve reconciliation. Despite the many obstacles to achieving these aims, we continue to uphold our responsibilities towards our people. We express our appreciation to our Arab brethren, in particular the fraternal Arab Republic of Egypt, for the efforts being undertaken to end this division, hoping that they will be successful. My Government – the National Consensus Government – affirms its readiness to uphold its full responsibilities in the Gaza Strip once it is allowed to exercise its full authority and in the framework of one Palestinian political system, one sole legitimate authority, one law and one legitimate weapon. We are not a people that can be excluded on this earth; we are an indigenous people and our roots are deep across five thousand years. We insist on fairness towards us and the implementation of your resolutions. We have concluded agreements with Israel and they have abrogated all of them. Either Israel abides by these agreements, or else we will renege on them. Israel will bear the responsibility and consequences of this. There are also agreements with the US administration, but why have they reneged on all of them, and how should we address this? Please answer me. Either it respects its commitments, or we are not going to comply with any of these agreements. We will also not accept sole American mediation in the peace process because the US administration has lost its eligibility due to its recent decisions. We have also concluded agreements with Hamas. Either they implement them fully, or we will distance ourselves from any agreements or measures that are concluded without our approval and will not bear any responsibility. Lastly, allow me to reaffirm to you that we will not revert to violence and terror, no matter what the situation or conditions are. I pay tribute to all freedom-loving countries and peoples that continue to extend political, financial and humanitarian assistance to our people in their struggle to bring an end to the occupation, to strengthen our institutions in preparation for full independence, and in support of UNRWA. I urge the General Assembly to ensure support to this Agency as a matter of international responsibility. UNRWA was established by a General Assembly resolution [302 (IV)] in 1949 and was mandated to provide assistance to the Palestine refugees until the achievement of a just and permanent solution for their plight. In conclusion, I salute our resilient and brave people in Palestine, in the refugee camps and in the Diaspora with deepest respect and admiration for their heroic stances and their great sacrifices in defense of our people’s inalienable rights in their homeland and their rights to self-determination and an independent State, with East Jerusalem as its eternal capital. It is inevitable that we will achieve our freedom and independence and that we will celebrate the independence of our democratic State despite the occupation’s illusions. I pay tribute to our honorable martyrs and courageous prisoners and say to all Palestinians that we are soon approaching our day of freedom and independence and that the darkness of occupation will soon vanish. Peace and God’s mercy be upon you. 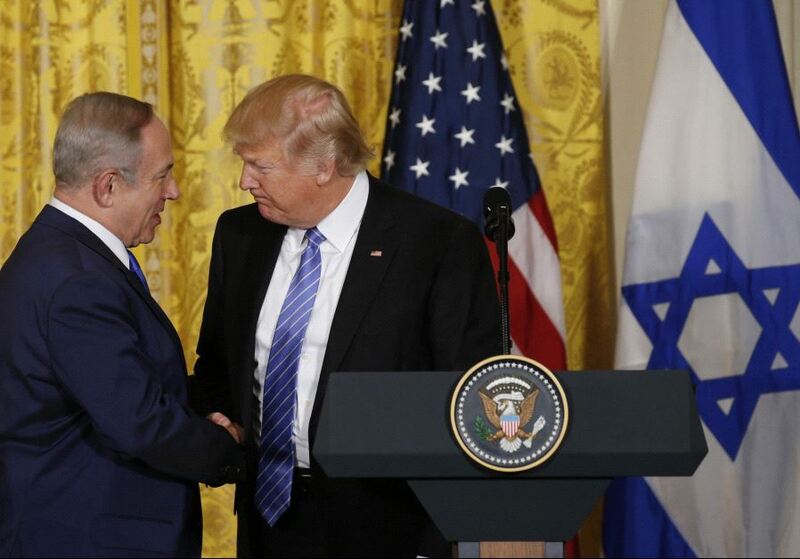 In the midst of a UN speech praising the Israeli government and their heavy-handed tactics against the Palestinian civilian population of the territory the Israeli military has been occupying since 1967, Donald Trump voiced support for the ‘two-state solution’ to the conflict. In response, Israeli Prime Minister Binyamin Netanyahu stated that, “Palestinians will never have a state” as long as he is in power. However, since 1933, the Montevideo Convention has been the internationally-accepted definition for a state under international law. Adopted by the Seventh International Conference of American States, the convention stipulated that all states were equal sovereign units consisting of a permanent population, defined territorial boundaries, a government, and an ability to enter into agreements with other states. Israel, although recognized as a state in 1948, has never defined its borders, and has, through the decades, encroached further and further onto Palestinian land, so that it now controls more than 80% of the land area of what was, until 1948, the land of Palestine. But Netanyahu criticized Trump’s statement, saying that Israel must permanently maintain its military occupation and control over the Palestinian civil population, with no Palestinian state that is both sovereign and self-deterined.